Place frozen rolls about 2 inches apart on a greased baking sheet. Cover rolls with plastic wrap. Refrigerate overnight to let dough thaw and begin to rise*. Generously grease twelve 2-1/2-inch muffin cups or coat with nonstick cooking spray. In a small bowl whisk together the melted butter and maple syrup until combined. Divide mixture among muffin cups. Sprinkle pecans into cups. Set aside. Cut each roll into 4 pieces. Place two roll pieces in each prepared muffin cup, pressing together lightly. Bake in a 350 degree F oven about 18 minutes or until golden brown. Cool in muffin cups on wire rack for 5 minutes. Invert onto a large platter. 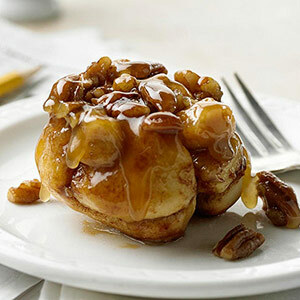 Serve warm drizzled with frosting from roll package, if you like. Makes 12 rolls. * To save time, substitute a 12.4-ounce package (8) refrigerated cinnamon rolls for the frozen cinnamon roll dough and omit the overnight rise. Cut each roll into 3 pieces. Continue as directed, except bake for 15 minutes or until rolls are golden.